San Diego, CA: DSD Business Systems, a leading VAR in the ERP, Accounting, HR software and Enhancements sectors, has announced the acquisition of Realized Financial Solutions, Inc. (RFSI). Based out of Plainville, CT, RFSI has been a Sage reseller and partner since 2008, serving customers throughout the New England area. 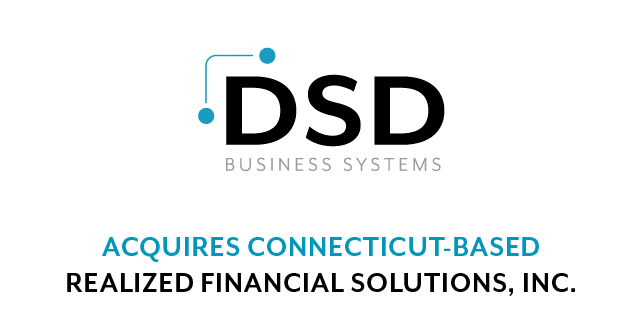 After being a valued technology partner of DSD Business Systems for over 10 years, they now announce they’re joining forces in business. With the goal in mind of expanding their businesses, as well as providing even more resources and skilled professionals for their customers, together the companies are very excited to be a united front for the future. RFSI, much like DSD Business Systems, has been selling and supporting Sage Software for more than 30 years. They’ve set themselves apart over time which shows with their recognitions for best-in-class service including the Sage Customer Excellence Net-Promoter program for four consecutive years. Mark Semmelrock, CEO of RFSI, is also excited about the business move. DSD Business Systems provides expertise in the selection, customization, integration, implementation, training and on-going support of business management software systems. This can also include the IT infrastructure necessary to support them. DSD has been in the software industry for over 35 years. Headquartered in San Diego with 42 offices throughout the US, as a trusted re-seller and developer we are comprised of dedicated software and IT experts, consultants and CPA’s.